Veterinary drugs are basically used for the treatment of numerous diseases in pets. Further, rise in the number of pet ownership has been witnessed in recent years. Likely, the number of pet ownership is anticipated to increase as companion animals provide positive health benefits such as low blood pressure, reduced anxiety, affectionate response and improved well-being. Moreover, pet owners are more concerned about health and welfare of their pets owing to the continued strengthening of the bond between pet owners and their companion animals. These factors demonstrate the willingness of animal owners to pay for veterinary drugs, considering the welfare of the animals. Further, the companies are working to develop innovative veterinary drugs for the treatment of animals. Likely, rising number of serious diseases among pet animals such as foot and mouth diseases, ringworm and others are encouraging the companies to develop and introduce innovative animal drugs in order to increase their lives and improve the quality of life. These innovative products will boost the demand for veterinary drug products. Moreover, penetration of internet into the life of the people has changed the way of business. Various pharmacy companies are supplying the pet veterinary drugs and vaccines to the consumers through online shopping. The online platforms serve a dual purpose of selling as well as advertisement of the product. Veterinary drug manufacturers are heavily investing in R&D and working on the development of innovative and efficacy pet veterinary drugs. The presence of supportive government regulation and increasing ownership of pet is creating opportunities for the market players to introduce new and innovative products into the market. Furthermore, the top companies are committed to massive R&D in order to ensure their large term competitiveness. The Brazil pet veterinary drugs market is expected to expand at a CAGR of 7.1% during the forecast period of 2017-2024. Further, the demand for parasiticides is expected to dominate in the conditions segment and is anticipated to have a share of more than 41% by 2024. Moreover, by vaccines segment, the demand for recombinant vaccines is estimated to remain highest due to the prevalence of pet diseases coupled with increasing number of pet population in Brazil. Further, availability of diversified parasiticides drugs is providing specific solutions to the diseases in pets. In Brazil, State of Rio Grande Do Sul dominated the Brazil pet veterinary drugs market in 2016. Further, the state is projected to continue its dominance over the forecast period i.e. 2017-2024. 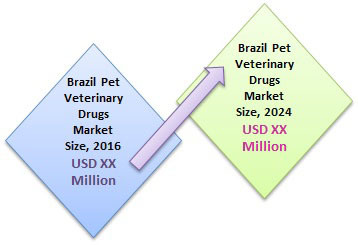 Sao Paulo is projected to witness a robust growth in pet veterinary drugs market by the end of 2024 owing to the high adoption rate of pets in the state. Further, continuous strengthened bond between pet and pet owners and high disposable income is believed to increase the demand for pet veterinary drugs in the Sao Paulo. Rising incidences of infections and diseases in pet animals are the major factors behind the growth of pet veterinary drugs market. Further, pet diseases and infections have the risk of being transmitted to humans. This factor is spurring the demand for pet veterinary drugs as associated infections and diseases can be life-threating. Moreover, the infection rate among pet animals has been continuously increasing. This is expected to increase the demand for the antibacterial and anti-parasitic veterinary drugs in the upcoming years. Furthermore, the trend of adoption of pets is increasing the risk of diseases transmitted to humans by animals. Rising government regulations to protect humans from animal transferable disease are opening the opportunities for the pet pharmaceutical drugs manufacturers to develop and introduce various products to control the disease. In addition to this, defined standards by the government healthcare agencies ensure the quality, safety and efficacy of animal health care products and to prevent the penetration of substandard veterinary drugs in the market. This factor is increasing the market revenue of organized players and encouraging them to develop and launch new and innovative animal healthcare products. Moreover, approval of various drugs by the government pharmaceutical licensing agency in the previous years indicates the attractiveness of animal healthcare business segment. Further, this has given rise to set up of various veterinary research institutes in the region. However, the high cost of the development of the pet veterinary drugs further increase the overall cost of drugs which is hampering the growth of the pet veterinary drugs market. Further, recent economic recession in Brazil has slowed the growth of pet veterinary drugs market in the country. Moreover, lack of awareness about animal welfare medications, zoonosis medications and food safety medications is likely to dampen the market growth of pet veterinary drugs market across the globe.